Only a few churches can boast they are in the original building 100 years later. Scobey Lutheran Church was built in only a few months back in 1914. Read the early history of our church. Scobey Lutheran has a rich history in music. We have been blessed with many wonderful people who have shared their talents with the congregation and the community. 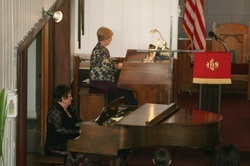 Above is one of our regular organists, Ellen L. and JoAnn G. on the piano playing a duet for Offertory.